Round 2- Sprint Distance Age Group Nationals — James Thorp. Triathlete. The sprint distance race was held the day after the Olympic race in Milwaukee and I woke a little sore from the previous day, but nothing I didn't think I would be able to manage. I made the same plans as for the Olympic race but decided to stay down at the venue and have a bit of fun watching and cheering rather than heading back to my hotel. Unfortunately, strictly advertized security measures meant that I ended up having to carry all my stuff in a string bag and big clear plastic bag with no handles down to transition. When I arrived at transition I was able to watch some of the earlier waves head off and do some cheering before I went off to start getting warmed up. As I was just getting into my warm up they called a delay to the start of the race so I sat down for a little while and tried to figure out what was going on with a lot of people around me. I wasn't too worried about the delay as it ended up giving me a bit more time to self massage and do some dynamic stretching in order to get myself a little loosened and warmed up before the race. The delay ended up being about 45minutes due to safety concerns for a swimmer that hadn't check out after deciding not to race. I understand the need to make sure safety comes first in a situation like that and I was glad not hear anyone complaining about the delay when the situation looked serious. After heading down to the swim start area, I hopped in to do a little bit of a warm up and make sure little things like my watch and wetsuit weren't bothering me before swimming over to the starting area of the dock. It seemed as though I had just swam over to the dock before it was called we had 45 seconds before we started. This was a little frustrating for a lot of people that were scurrying to get in position after thinking we should've had a few more minutes. As the horn went, I was able to get out in front a lot easier than in the Olympic race, this was due to the fact that our wave was slightly smaller and less competitive in the sprint race. As we got the first turn I was able to get around with not much problem and worked hard to stay near the front of the swim. The waves ended up being so close together that we actually caught someone in a previous wave before the first turn buoy. So from there on we were going in and out of two different waves ahead of us. This was a tough situation because you always try to be mindful of the swimmers you are going past, particularly at the back of a wave, but you also are trying to stay on the feet of the guys ahead of you which sometimes causes chaos. I knew my race had a couple of good swim-bikers that also raced yesterday so I made it my goal to try and push hard in the swim and stay with the leaders to give myself a chance on the bike and hopefully hammer on the run. As we exited the water, I ended up being 3rd into T1 and was positioned well. I was surprised that the swim times from our wave were a little slower given I had swam 20 minutes and was positioned a bit better the day before and split 11 minutes in the sprint, I noticed some of the guys in my wave had similar splits and maybe it came down to the quick succession of the waves or a bit of fatigue after the Olympic race. I was glad to get through T1 safely and out onto the bike positioned well. I felt pretty good on the bike and tried to hammer it hard to make sure I gave myself a chance on the run. After having a relatively good run the day before, I was confident that I might be able to move up a spot or two on the run if I ran well. The bike course for the sprint race was actually much tougher than the Olympic course given it accounted for all the elevation change from the previous race and upon going up and over the bridge, we had to turn around and come back over. This meant that my average speed was actually slower in the sprint race despite pushing harder and putting out higher watts. The bike leg wasn't too eventful for me, I was able to see the guys that were ahead of me out of the water at the turnaround and was confident if I rode well back over the bridge I would give myself a shot. As I rode into T2 I was feeling well positioned and ready to hammer the run. That is when things started to go wrong for me. I went down the wrong row of bikes and could not find my spot in transition. This was a silly mistake from my part and I have learned that you can not rely on gauging where your spot is in relation by other bikes around you. The reason I ended up going down one row too early is because I remembered that I should have gone down the row where the last set of bikes were. However given the bikes from the last row were still out on the course, I ended up going one too early. After yelling to no one in particular asking where my shoes were I calmed down read the numbers and hopped under the transition bar to the right row. This ended up costing me about 30 seconds, which in a sprint race can be a lot of time. I whipped my shoes on and practically sprinted out of transition trying to catch the guys ahead of me. As we got out onto the run, I was able to see up the course to 3 guys that I was looking to catch. I thought they were about 45 seconds ahead of me and I thought if I ran well I could bridge the gap. Like the Olympic distance I opted to race without my GPS watch and just give it everything I had to do as well as I could. This was actually not a problem for me and I was patient in trying to reel in the guys ahead of me. I was grateful for the long straight sections of the course which allowed me to see the guys I was chasing. In the past, this is when I have had some of my best runs. At the turnaround point, I was second in my age category and we both took note of where we were placed. We both knew each other as I had run down the same guy in the Olympic race, albeit, within the last mile and a half of that race. As I went by, I set my sights on 2 younger 16-19 year olds up the road that I had been chasing on the bike. I was able to go by one of the guys at about mile 2 and kept hammering away at the last guy on the nice flat part of the course on the way back to the finish. I was slowly bridging the gap to him but was running out of road. As we got to the finish shoot I gave it everything I had to try and overtake one more person with the thoughts that it might be the difference between an overall podium or 4th. This ended up being the race for 4th and 5th overall and I just ran out of room by .13 of a second leaving my 5th. 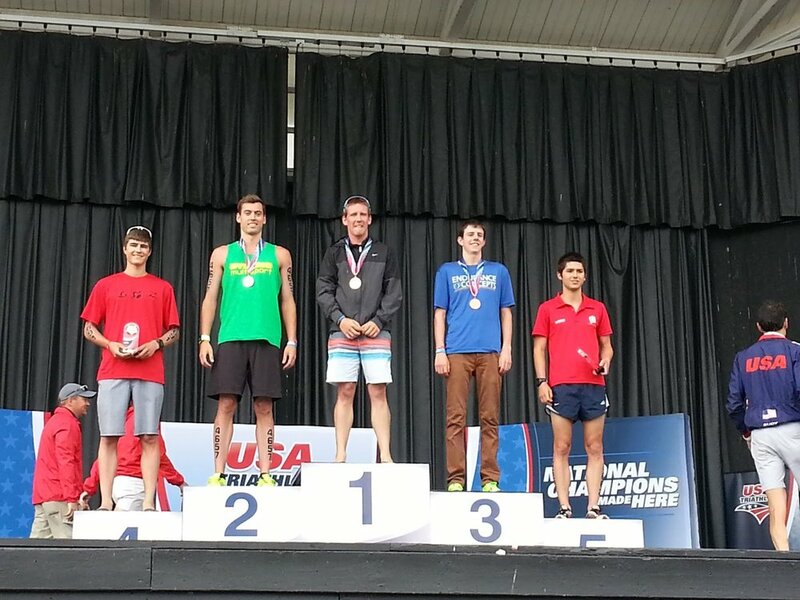 To finish 5th overall in any nationals event is something that I am happy with and I was relieved that my mistake in transition didn't really cost me anything as the third place finisher was about a minute ahead of my time anyway. 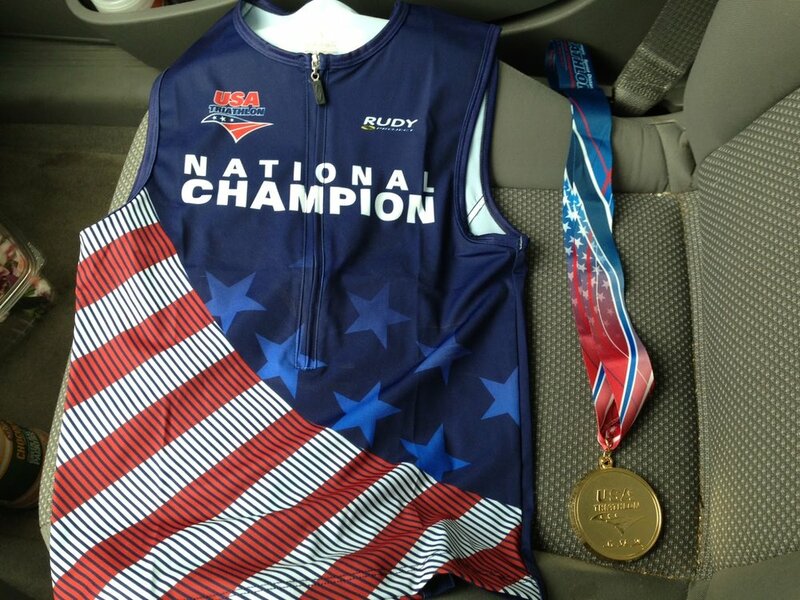 I was glad to have stuck around for both races and am still a little shocked that I own a national champion jersey just a year after doing my first triathlon and owning a bike. These races have given me confidence in my future in triathlon if I keep doing the right things and believe in my training. Thanks to the city of Milwaukee, all the volunteers and USA Triathlon for an awesome weekend of racing on two great courses! I am now going to take a few days off to recover and celebrate Bryna's birthday this week before building into training for Miami 70.3 in October. Qualifying for world champs in sprint, Olympic, 70.3 and Ironman distances all in one year far surpassed my own expectations for the season. The pressure is off for the rest of the season and I am looking forward to seeing what lies ahead!